Farms produce not only foods, fiber, and fuels, but also can create widespread benefits to our environment and our economy. 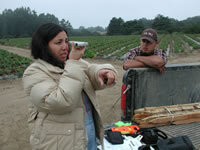 Agriculture is one of the largest industries in Santa Cruz County, bringing about $500 million to the local economy every year. Water is a scarce and valuable commodity in California, and especially so in the Pajaro River Valley. Reliance on groundwater has contributed to groundwater aquifer and an increase in salt water intrusion in the valley. The RCD can provide services and publications for landowners, growers, and producers interested in practices that support maintaining agricultural viability, while protecting our scarce natural resources. Irrigation management and water conservation: Implementing conservation practices, modifying management regimes, and upgrading farm infrastructure can save water and money. 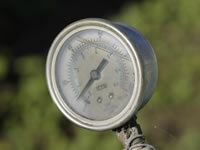 Such practices include evaluating irrigation distribution uniformity and efficiency, equipment upgrades, or using adopting technology to fine-tune irrigation frequency. Nutrient Management: Nutrient management involves managing the amount, source, form, placement and timing of nutrient applications. Good management will supply plant nutrients for optimum forage and crop yields, minimize entry of nutrients to surface and groundwater, and maintain or improve chemical and biological condition of soil and reduce costs. 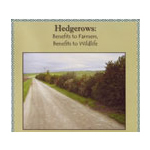 Hedgerows: Hedgerows are linear planting of vegetation, including trees, shrubs, forbs and grasses. They are easy to establish, can be designed in a number of ways, and can have many important benefits, such as attracting beneficial insects, stabilizing the soil, improving water quality by acting as filter strips to catch sediment and filter surface water, acting as windbreaks, suppressing weeds, and providing wildlife habitat. Groundwater recharge: Groundwater recharge or deep percolation is a hydrologic process where water moves downward from surface water to groundwater. 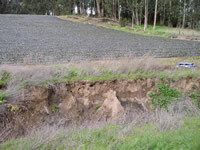 Basins, swales, and temporarily or permanently retired agricultural land may be used to increase infiltration depending on soil, topography, etc- and ultimately lead to replenishment of the aquifer. 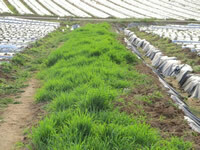 Row Arrangement: Row arrangement, or furrow alignment, is the practice of establishing crop rows in the most beneficial direction, grade, and length to provide adequate drainage and erosion control and optimize use of rainfall and irrigation water. 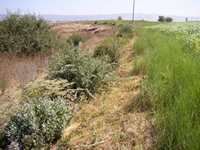 Erosion Control: Erosion from streambanks and upland areas can cause significant on-farm and off-farm damage and contribute significant sediment farm ditches and waterways. There are a number of erosion control practices, not specifically discussed here, that can be used to protect valuable cropland and our natural resources, such as gully repair and streambank protection. Cover Crops: Cover cropping is the practice of annually planting crops for the purposes of controlling erosion , managing soil fertility, improving soil quality, conserving water, reducing weeds, , and breaking pest and disease cycles. Cover crops add organic matter and nutrients to the soil and may reduce the need for future fertilizer applications. Vegetative Treatment Systems: A Vegetated Treatment System is a planted area that water is directed through to improve water quality. These systems take advantage of the process of phytoremediation, which means the removal of contaminants from water or soil by plants. Vegetated Treatment Systems are flooded or the soil is saturated for a certain period of time to treat surface water. These systems are particularly well suited for removing nitrate and certain pesticides. 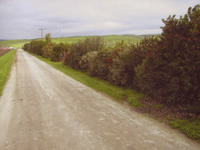 WinterRoad Seeding: Roads are one of the areas most vulnerable to erosion on the farm. Road seeding and/or mulching throughout the winter months can help protect roads, conserving fertile topsoil and reducing the cost of retrieving that material and reincorporating it into farm fields. Specific recommendations on the type of grass, seeding rate, or mulching rate can be provided to ensure that cropping regimes for the farm are not impacted. 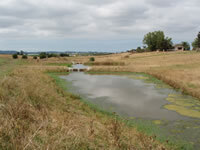 Sediment Basins: A sediment basin is a seasonal or permanent basin constructed on farms to capture sediment that is carried by stormwater or agricultural tailwater. 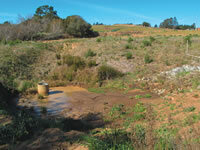 Soil is cleaned out of the basins annually, biannually or triennially (depending on basin size and rate of erosion). The material is reincorporated into cropland during land preparation activities. 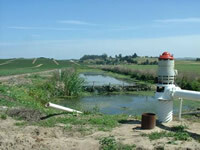 Agricultural basins are a relatively inexpensive practice that prevents the loss of valuable top soil from leaving the property, and improves downstream water quality, farmland, neighboring properties, and fish and wildlife areas. A basin is created by excavation and construction of an embankment so that sediment carried by stormwater runoff is temporarily detained, allowing the sediment to settle out before leaving the basin. The appropriate size of the basin is dependent on the acreage of farmland draining to it, the type of soil within fields, and the frequency material will be removed from the basin. Filter Strips: Filter strips are strips or areas of vegetation designed to remove sediment, organic matter, and other pollutants from runoff using filtration, deposition, infiltration, absorption, and volatilization. 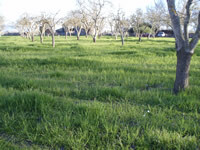 Filter strips are traditionally planted on farm edges and are of varying widths, planted with native or non-native, non-invasive grass species. Specific recommendations on the type of grass and seeding rate can be provided to ensure that cropping regimes for the farm are not impacted.